The makers of Uncle Ben’s rice have recalled various versions of the product that were only sold on the wholesale market following multiple incidents where numerous people fell ill after eating the rice at school lunchrooms. 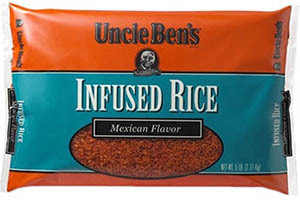 The recall involves several varieties of Uncle Ben’s Infused Rice products, but only those sold at wholesale in 5-lb and 25-lb bags. Uncle Ben’s rice sold in smaller bags at supermarkets and other retail locations is not being recalled. USA Today reports that the most recent incident involving suspected rice-related illnesses occurred last Friday, when children at three different schools in Katy, TX, experienced burning, itching rashes, headaches and nausea. While it’s too soon to say that all the incidents are related to the same source or exactly what the problem with the rice is, it’s possible that the illnesses may be due to too much niacin (vitamin B3) in the rice. The FDA found high levels of the vitamin in the Illinois rice. Any foodservice company or anyone that purchased the following products (in the 5-lb or 25-lb size; again, all other variations are not included in the recall) from a wholesaler or distributor should not eat, says the FDA.